Alison Iraheta attends Green Dot’s Animo Ralph Bunche charter school in the Second District. She is also a finalist on American Idol tonight. So if you like Alison’s performance be sure to vote for her! Not only does Alison attend school in South L.A., but her sister teaches at Green Dot and her father also works for Green Dot. 17 of the 18 Green Dot charter schools are located in the Second District. American Idol is on Fox tonight at 8pm. Viewers can vote as many times as they like by calling the phone on the screen tonight or via text. The number is 866 436-57 _ _ . The last two numbers depend on what number she is assigned this evening during the performances. Alison has been singing since she was three years old. And she was first “discovered” performing at a talent show put on by the St. John’s Well Child & Family Center. She loves animals and running. She actually ran with Students Run L.A., and has even completed the L.A. Marathon twice. She supports Padres Contra el Cancer (parents fighting cancer) and works with Children’s Hospital in Hollywood and the Rose Breast Cancer Society. 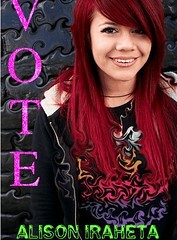 Tags: Alison Iraheta, American Idol, Animo Ralph Bunche, Education, Entertainment, Green Dot, South L.A.